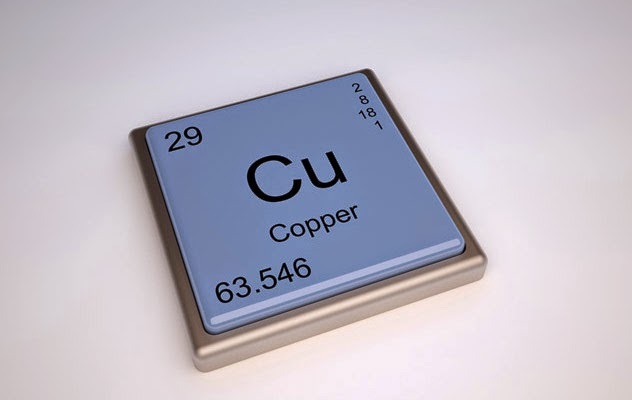 The International Copper Study Group (ICSG) has released preliminary data for the month of November last year in its recently released February 2015 Copper Bulletin. According to preliminary ICSG data, the refined copper market balance for Nov ’14 showed an apparent production deficit of nearly 40,000 metric tonnes. World refined production increased by nearly 8% during the first eleven months of 2014. Primary production was up 9%, whereas the secondary production increased by 3%. The global refined copper production during the month of November showed a surplus of 61,000 t. The balance for the initial eleven months of 2014 indicates a production deficit of 640,000 t. This is in comparison with a production deficit of 278,000 t during the corresponding eleven-month period in 2013. The world copper mine production has increased by around 1.5% during the first eleven months of 2014. Concentrate production was up 1% during the period. The mine output from Chile remained almost unchanged. 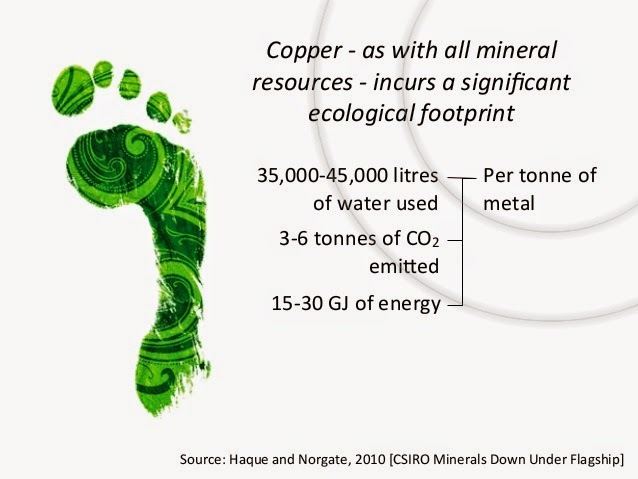 However, other major copper producing countries recorded increased production. The production increased by 1.5% in Peru, 8% in the US and 9% in the Democratic Republic of Congo. The other nations to report higher output were Mexico (+7%), Canada (+11%) and Mongolia (+35%). On the other hand, ban on exports of copper concentrates constrained the output from Indonesia by 25% year-on-year. The temporary shutdown at Lumwana mine and reduced output levels from other mines resulted in 7% drop in Zambia’s production. The output from Australian mines during the eleven-month period was down 3%, whereas those from Papua New Guinea were down by 26% on account of mine landslide and heavy rains. Meantime, global usage of the metal is estimated to have increased by over 10%, boosted by robust demand in China. The Chinese apparent demand increased by 17%. The usage by world countries excluding China has increased by 4%. The EU region, other Asian countries including Japan and Middle East/ North African region countries witnessed growth in apparent usage. The copper usage by the US has declined by 1.5%. (Reuters) - A drought in Chile is hampering copper production, a water-intensive business, in the world's biggest producer of the metal, one more factor that could trim an expected surplus this year. Both Anglo American and BHP Billiton have said the extremely dry conditions have hit production due to restrictions on water, used for everything from toilets for workers to separating the metals in the ore body from waste rock and tamping down dust that heavy trucks kick up. "The one caveat or the risk I think that we need to flag... is Chile is still in drought," Anglo Chief Executive Mark Cutifani told a results presentation last week. "It remains a risk, and in fact it was impacting our operating performance in November and December." In some parts of Chile, January was one of the driest since records began, exacerbating a drought that began in 2007, said Chilean meteorologist Claudia Villarroel. Winters in central Chile are becoming drier because of climate change, she added. Indeed, Anglo's Los Bronces mine in central Chile has been the worst affected of the company's mines. It warned that water scarcity at the mine, the world's sixth-largest copper producer, could cut as much 30,000 tonnes or 4 percent off Anglo's overall copper output this year. Output at BHP Billiton's Escondida, the world's largest copper mine, in the bone-dry Atacama, fell 2 percent in the second half of 2014, weighing on a strong operating performance. State copper commission Cochilco has said that water scarcity is "a latent risk for mining in Chile". Lower rainfall and river flow has led the levels of aquifers and reservoirs to drop or dry up completely, giving miners fewer options. In Chile, the situation is complicated by the fact that many of its copper mines are located in the Atacama, the world's driest desert. Analysts polled by Reuters have forecast a global market surplus of 221,000 tonnes this year. But a variety of production problems are already raising questions about whether the market may end up tighter than expected. Several mining companies have already cut their forecasts for 2015 copper production due to geological and technical issues in other countries. "This (Chilean drought) bears out our view that there's been too much over-optimism about copper mine production this year," said Caroline Bain, senior commodities economist at consultancy Capital Economics in London. Last month, Cochilco cut its forecast for copper production in Chile this year to 6.0 million tonnes, from a previous estimate of 6.2 million. In 2014 the country produced 5.8 million tonnes. Chile's falling ore grades also mean increasing amounts of water are needed to produce the ore body, industry sources say. The shortages have also pitted mining companies against farmers and others who fear for the quality and quantity of their supplies. Increasingly, miners in Chile are turning to more expensive options like seawater desalination and sewage treatment plants to get water for their needs and for the communities around them, driving up costs. Escondida is building a $3.4 billion sea water desalination plant, which is due to start operations in 2017. State-run Codelco, the world's biggest copper miner, said the drought had not yet directly affected production. But it said it had anticipated the dry conditions and boosted water efficiency, including reaching recycling rates of over 80 percent at some operations. Benchmark copper prices on the London Metal Exchange (LME) touched a 5-1/2 year low last month, partly due to worries of overproduction. MCX is hoping that the commodity transaction tax will be removed in the upcoming Union Budget, according to PK Singhal, Joint Managing Director . In an interview with CNBC-TV18, Singhal says Taiwan is the only other country which levies a CTT. He says commodity trading volumes have come down significantly since the imposition of CTT, and this is also leading to grey market transactions in which the government gets no revenue at all. Average daily turnover on MCX has fallen from Rs 50,000 crore to Rs 30,000 crore since CTT was introduced, Singhal says. MCX has regained the market share it lost in the aftermath of the scam at NSEL, Singhal says. He feels the shifting of the Forwards Market Commission to the Finance Ministry from the Consumer Affairs Ministry is a positive step. Latha: The prime purpose of getting you is to ask you what you are expecting from the Budget for your trade. A: If you ask me about expectation then our first basic expectation from the Budget is finance bill - either the Commodities Transaction Tax (CTT) is removed or it is reduced. However, world over nowhere other than Taiwan there is any transaction tax on commodity futures and after the imposition of transaction tax on commodity futures the volumes have fallen down. It is not a question of volume because basically the hedging efficiency has lost and out of top five exchanges in the commodity futures markets in the world three are in China. The present vision of our government is to make ‘Make in India’ story successful and for that you need a good hedging platform and that hedging platform is not available for small and medium enterprises (SMEs). Government has rightly exempted agri commodities from CTT but somehow there is a necessity to revisit the CTT on bullion as well as base metal at least because before the imposition of CTT the impact cost in Indian MCX bullion contract was lower than CME. So after the imposition of CTT the cost of transaction has increased manifold. Exchanges are charging Rs 183 per crore as a transaction cost as against that CTT is Rs 1,000 per crore on the sales side which results into the increase in the impact cost from Rs 183 to Rs 683 per crore. I think nowhere there is a tax where more than what you are paying to the exchange as a transaction cost you are paying by way of tax and this tax is basically not necessary. Sonia: Can you give us a sense of how much the volumes have fallen because of the imposition of CTT? A: Yes, I can give you a very clear sense. In financial year 2011-12 and 2012-13 and as well as prior to CTT imposition i.e. 2013-14 the volume in MCX – I can tell you about MCX because almost 100 percent volume in base metal bullion and energy takes place in MCX. It was in the range of 52,000 to 55,000 crore per day on single side which after imposition of CTT was reduced to about 30,000 crore. So you can understand how much volume fall has taken place and after that there was National Spot Exchange Limited (NSEL) problem and that is a different issue. So, those volumes fall which was due to NSEL issue has come back. Now we are again having same market share, but you see in agri commodities there is no CTT. Even then there is not much increase in agri commodity volume because you know there are lakh of SMEs and as far as our gold contract is concerned you ask anybody even a small jeweller to the biggest jeweller or exporter in jewellery they hedge on our exchange. Latha: Any other expectations, have you had conversation with the ministry. You have seen the movement of FMC to the finance ministry from the consumer affairs ministry and now possibly the eventual merger into Securities and Exchange Board of India (SEBI) as well. Is the longer term terrain in which you fight much cleaner now. Are you expecting therefore better business? A: There are two issues. One issue is very relevant which is most necessary. As per the Nelson report prior to CTT it says that the ‘dabba trading’ or bucket shops volume is three times of the official volume in the exchanges and this bucket shops or dabba trading is all illegal trades. It happens in cash with no audit trail. So it is one of the biggest damage the country has because it is all black money transaction and after imposition of CTT because the cost of transaction has increased as per the market sources it is now about 10 times of the exchange volume. So, FMC presently in the present avatar does not have any infrastructure, they don’t have manpower, they don’t have any raid and panel provisions to take action against the dabba traders. So the biggest benefit in case the merger of FMC with SEBI takes place then that power will come, but I have my own doubts about whether the merger will be helpful because commodity basically other than gold all the other commodities are consumable and it is not asset class. 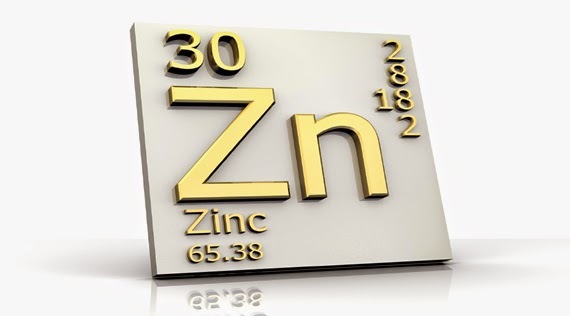 Base metal is consumable, energy is consumable. So basically I don’t think SEBI has a bandwidth or the merger will be the right step but at least if nothing is happening, people make compromise. They think, if FCR is not passed at least it is better that the regulator will have a strong panel action. However, one thing I fully agree that shifting of FMC from the ministry of consumer affair to the Finance Minister was a very positive step and it was basically because finance ministry that way is more responsive and I am not saying that consumer affair ministry was not responsible but the point is finance ministry is more clear about what is happening abroad in the commodity futures trade or securities market, so they are more updated. 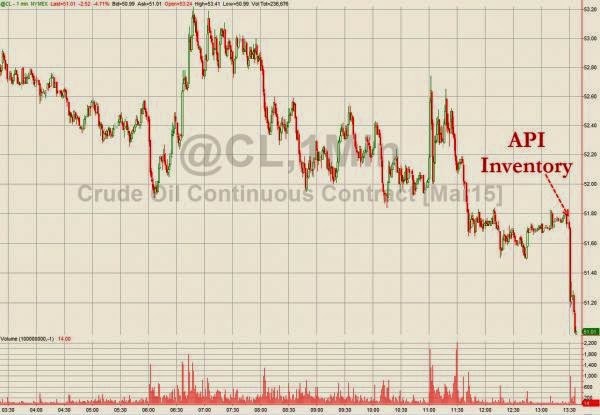 How can options trading gain ground in commodities ? The commodities futures market underwent changes in 2003 with many policy reversals. But option-based derivatives are yet to gain ground in commodities. Though the Forward Contract (Regulation) Bill, 2010, has provisions for option trading, its execution requires considerable attention from the regulator, commodity exchanges and market participants. The government can replace the price support scheme with minimum guaranteed price (MGP). Policy makers are passive on the adoption of option-based trading despite the benefits. Option can be over-the-counter and exchange-traded. Similar to the futures, option requires at least two parties to exercise the contract. Exchange-traded option can help to mitigate counter-party credit risk as the contract will be more standardised in nature. Farmers can avoid distress sales if they can opt for a longer put option, paying a put premium. Commodity processors, on the other hand, can hold a long call option, paying a call premium. Intermediaries between farmers and processors can act as option writers holding a short put and a short call position. They can be market agencies that procure from farmers and sell to consumers or civil supplies agencies such as FCI, STC, NAFED, HAFED and several private agencies. The payoff and profit structure are different. While farmers might delimit their potential loss, processors may have unlimited loss if the commodity price falls below the strike or exercise price of the contract. Farmers could wait for a better deal to exercise the contract. Thus, a minimum guaranteed price can be embedded in the long put option. On the other hand, processors can reduce their exposure through dynamic or “delta” hedging that implies that number of call option bought is relative to number of stocks sold. Based on financial aptitude, financial knowledge, and financial behaviour, agents can leverage their risks or increase their spread by formulating several option trading strategies. In addition, they can mix futures/forward and option contract (if offered in identical commodities) to protect them from unexpected losses, such as, “covered call” or “protective put”. Option pricing (call and put) is important for an efficient commodities market. It depends on several variables known as Option Greek, which includes delta, gamma, vega, theta and rho. For example, one per cent increase/decrease or any absolute in underlying commodity price seeks to impact the relative change in option price or premium. Similarly, market volatility, time of the contract and rate of interest (asset borrowing and storage costs) seek to determine the magnitude of change in that option price. If option market needs to be efficient, call-put parity should hold. Therefore, there should be a small deviation between market offered rate and an implied rate. Pricing exercise may be accomplished using binomial option pricing, Black-Scholes pricing, KMV-Merton pricing based on the model parsimony and robustness. Introduction of option in commodities calls for a careful concern of the regulator and market agencies. It should be implemented in a phased-manner. Fundamental analysis of commodities is required on two fronts: pricing of commodities and variables influencing the option price. Option need to be introduced in those commodities which are having liquid contracts and significant trade volumes in futures/forward and spot markets. However, speculative asset should be avoided. First, exchange-traded option may be introduced in non-MSP; and then in MSP-based commodities. Commodity exchanges need to work on the contract specification and spread for assessing liquidity. Option contract implementation is critical to encourage commercial users. The coming Budget may shed light on the fate of this derivative instrument, given the possibility of SEBI-FMC merger. Second, since the underlying asset is commodity, a comprehensive study needs to be undertaken with respect to economic fundamentals, price and non-price factors, stock-to-use ratio or carryover stock, crop management practices. Farmer Producer Companies (FPCs) can work out the prospect of option market as they procure the produce from farmers’ interest groups at MSP or market offered rate and then, distribute to the Small Farmers’ Agribusiness Consortium (SFAC). Instead of procuring at MSP, SFAC through FPCs should offer minimum guarantee price to producer-members which might improve farmers’ marketing decisions and their risk-return metrics. FPCs need to create or lease in storage space for holding farmers’ produce until they deliver in exchange platform. NCDEX may offer customised contract to FPCs and NABARD might act as clearing agent of commodity exchanges or could train or handhold FPCs for account opening and daily and final settlement. Service providers need to be empanelled by exchanges to safeguard farmers from any unexpected margin call or mark-to-market loss. In other words, exchanges need to depute some third party to resolve any unwarranted default in the option market. 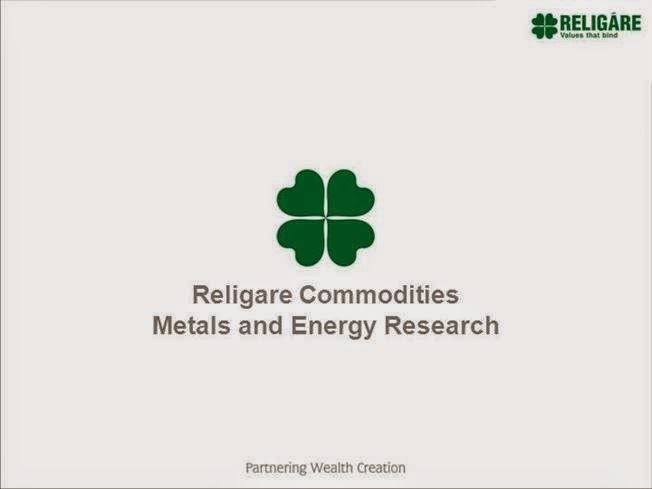 According to Religare Retail Research, traders and investors from commodity derivatives market are expecting the government to announce steps to restruc-ture the Forward Contracts Regulation Act (FCRA). This would increase depth in the market and will help in efficient price discovery, says the report. The market, like every time, has huge expectations and this time, hopes are revolving around lowering of subsidy burden, widening the tax net, supportive policies for the industry and rational allocation of funds. Also, some key points present in the agenda of the new government which should form part of the union budget should be to re-invigorate investment cycle and reviving Indian economy on a priority basis. With lower crude prices, government is now in a better position in terms of its fiscal balances as oil imports occupies a major chunk in our im-port bill. Commodity futures trading also deserves attention this time, keeping in mind government’s agenda of Make in India. A large number of measures are required to bring back liquidity and to make market more efficient. Amendment of FCRA: Traders and investors from commodity derivatives market are expecting the government to announce steps to restruc-ture the Forward Contracts Regulation Act (FCRA). This would increase depth in the market and will help in efficient price discovery. There is a need to increase market participation by allowing banks, MFs, FIIs which will also help in preventing price manipulation and help hedgers to efficiently hedge their exposure in physical markets. Abolition of CTT: Market participants are expecting the government to re-duce the Commodities Transaction Tax (CTT) which was levied in year 2013 on metals, bullion and a few processed agri commodities. Levy of CTT was strongly opposed by commodity exchanges, traders, bro-kers and investors. Commodity trading in India is just 10-year old and get-ting away with CTT may lure more participants, thereby increasing the over-all turnover. In India, more than 80% of the trade volumes take place in bul-lion, metals and energy and CTT has resulted in a significant drop in trading volumes in these segments. Unlike in stocks or agri commodities, daily movement in the above mentioned commodities are generally very low, re-sulting in most of the profits that a trader makes, being lost in the existing charges. FMC needs to take up with the Finance Minister on the need to reduce CTT to bring back liquidity and market depth in the commodity futures trading in the country. 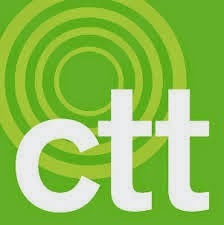 The CTT should be reduced to Rs. 1 per crore of trading to encourage the markets and the amount collected should be diverted to improve warehousing and infrastructure facilities. A reduction in excise duty on copper is widely expected this time, in order to improve the cost competitiveness of Indian capital goods companies. The government’s plan to turn India into a manufacturing hub will need a big budget boost. For this, a lot of metal will have to be imported into the country and hence import duty on ores and metals require a slash in import duty. This will likely boost metals’ market in India. Finance Minister Arun Jaitley may look at re-imposing five per cent customs duty on crude oil imports to shore up revenues by $3 billion and create a level-playing field for domestic producers. Presently, the government does not levy any import or customs duty on crude oil imports. On the other hand, domestically produced crude oil attracts two per cent central sales tax, something which imported oil is exempted from. Upgrading weather forecasting system – IMD, for accurate monsoon forecasts which could enable farmer to take informed decisions. Custom Duty on Gold will be Reduced From 10% to 6% Likely on Budget Day. The government is likely to announce a reduction in the customs duty on gold and the setting up of special notified zones for gems and jewelry in the budget. The customs duty on gold is likely to be brought down to 6 per cent from 10 per cent in the wake of a significant decline in the import of the yellow metal. The setting up of notified zones will boost the manufacturing of gems and jewellery, which is one of the sectors identified in the "Make in India" programme of the Narendra Modi-government. 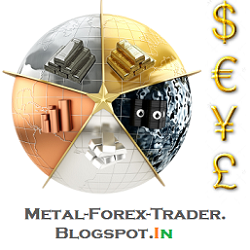 "Gold imports are declining continuously. The gems and jewellery sector contributes significantly to the country's total exports. On account of this, we are expecting a cut in the import duty," commerce ministry officials said. Gold imports in December declined to 39 tonnes from 152 tonnes in the previous month. The export of gems and jewellery has fallen 3.73 per cent year-on-year to $3 billion in January. "The low duty will curb the smuggling of precious metals, increase affordability of gold jewellery in the domestic market and enhance the cost-competitiveness of gold jewellery manufacturers in the export market," analysts said. The gems and jewellery sector, which employs about 3.5 million people, accounted for almost 13 per cent of exports in 2013-14. The sector is one of the 25 areas identified under the "'Make in India" programme, which aims at attracting domestic and foreign investments to boost manufacturing and create jobs. The notified zones would also import and trade in rough diamonds. "The mining companies will be taxed to the extent of invoices raised to Indian companies, eliminating middlemen involved in the trade. 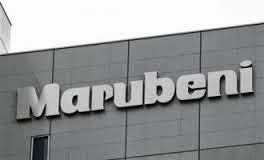 This will help India to become a rough diamond trading hub, and especially help small diamond polishing units in India," CARE Ratings said in a research note. 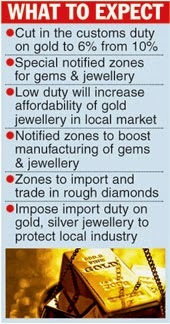 Simultaneously, the government may hike the import duty on gold and silver jewellery to boost local manufacturing. Officials indicated that the Centre could hike the duty on gold jewellery to 20 per cent and silver jewellery to 25 per cent from 15 per cent. The move will protect the interest of small artisans and provide an incentive to the local manufacturers of jewellery. In the run-up to the elections, the BJP had promised to ease restrictions on gold imports as the curbs had led to smuggling. Modi had said any action on gold should take into account the interest of the public and traders and not just economics and policy. Copper got a bit of press attention recently with headlines of a plunge in price. This was in early January and I hadn't looked at the copper chart for a few days and I was gobsmacked when I did. A plunge they say?! What a load of baloney!! If that was a plunge then they are in for a big shock later this year if my analysis is correct. But let's not get ahead of ourselves. Let's start with the small picture and then come back to the big picture which will reveal the likely shock in store. 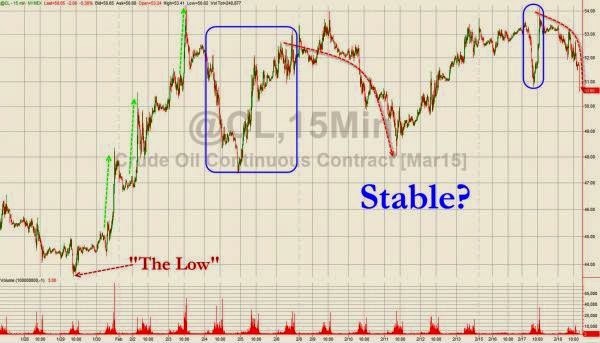 The recent low was a "three strikes and you're out" low consisting of three consecutive lower lows. This low was also accompanied by triple bullish divergences on the Relative Strength Indicator (RSI) and Stochastic indicator. This generally leads to a significant rise and while price has risen from that low the nature of the rise is nothing to rave about. Price has so far failed to take out the January 2015 high at US$2.65 which is denoted by the lowest horizontal line. Taking this into consideration, I believe price may be headed for a fourth lower low which is also accompanied by quadruple bullish divergences on the same lower indicators. That occurring really should lead to a substantial rally. Let's see. The Bollinger Bands show price bouncing up to the upper band and perhaps one last move back to the lower band is in store before a decent rally takes place. Other points of resistance are denoted by the higher horizontal lines which stem from the December 2014 low and December 2014 high and I favour any coming rally to take out these levels. Now let's skip to the monthly chart to begin examining the bigger picture. The RSI and Stochastic indicator are both in oversold territory so a rally should be on the cards shortly. However, both these indicators have readings showing new lows so any rally from here is likely to be a bear market rally. I would like to see the final low be accompanied by bullish divergences on the lower indicators. I have drawn an Andrew's Pitchfork which shows price trending down within the upper channel of this bearish pitchfork. If a rally is to take place soon then I am looking for price to test the upper channel line. And considering I expect a bear rally only then price should be rejected at this upper trend line. So where is the final low likely to be? I have drawn a green highlighted circle which shows where price exploded higher in a parabolic move. This area is at the 2008/09 lows of US$1.27. Price plunged into that low and them immediately launched higher in explosive style. Price often eventually corrects to these areas and I favour exactly that to play out here. I have added Fibonacci retracement levels of the move up from 2001 low at US$0.60 to the all time high in 2011 at US$4.65. I am looking for a deep retracement that closes in on the 88.6% level at US$1.06 which would see price clipping the zone whereby price launched higher parabolic style. Price putting in a low there around mid 2016 would also be at support from the middle trend line of the Andrew's Pitchfork. Let's now look at the yearly chart to get another perspective. The recent high in 2011 showed a bearish divergence on the RSI and Stochastic indicator. These indicators now appear to be trending down and not looking particularly promising for the bulls. I have added the same Fibonacci retracement levels from the monthly chart just to give a different perspective. I have also added a Fibonacci Fan which shows the 2008/09 low was around support given from the 76.4% angle. I am looking for the next major low to clip the 88.6% angle. Time will tell. If I am reading this correctly, then a massive 5 point broadening top is in play and price is now headed down to make a point 4 low. In this scenario, the 2006 high was point 1, the 2008/09 low point 2, the 2011 high point 3. If we do indeed get a point 4 low then I expect price to once again explode to new all time highs over the coming years as price eventually puts in the point 5 high. And I'd like to see the final point 5 high be accompanied by triple bearish divergences in the lower indicators. So while the move down in early January garnered some headlines, it really wasn't a major plunge. 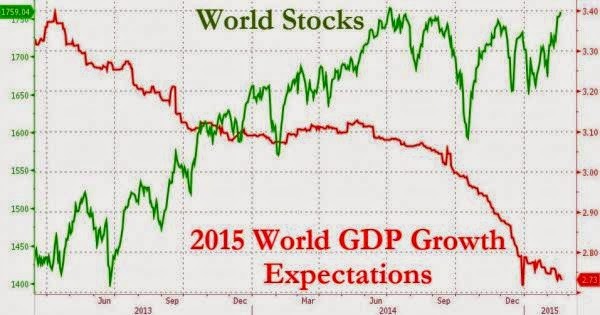 The real plunge is still to come. And expect much bigger headlines to come with it! API released its crude oil inventory data to subscribers and it printed an enormous 14.3 million barrel build (EIA tomorrow forecast at 3 million barrel build). This has sparked further weakness in WTI (not helped by refinery strikes, refinery fires, and storage capacities), pushing it to a $50 . One week ago we reported that central bank purchases of gold in 2014 were the second highest in the past 50 years, driven by purchases out of Iraq, Kazakhstan and - most of all - Russia, with no offsetting selling. But what about other more conventional sources of demand? Take jewelry, which while very strong in the beginning of the century, dropped off after the Great Financial Crisis, and then tumbled again after India imposed numerous restrictions on gold imports, which however merely forced the local population to find novel ways of smuggling gold into the country. This is what the WGC had to say about gold jewelry demand in 2014. Having suffered weak year-on-year comparisons for much of 2014, jewellery demand rallied to a strong finish, reaching 575t in the fourth quarter – 1% higher than Q4 2013. The sector was buoyed by good festival- and wedding-related demand in India, as well as by the seasonal holiday effect in the US and UK. Global annual jewellery demand of 2,152.9t, although down 10% year-on-year, was above the five-year average by a comfortable 5% margin. 2014 was a standout year for Indian jewellery. Demand reached a record 662.1t, topping the previous year’s total by 8%. This in spite of government measures designed to restrict gold imports being in place for much of the year. Wedding- and festival-related purchases drove robust demand of 179.1t in the fourth quarter, up 19% over Q4 2013. Indeed, the second half of the year was the strongest H2 in our data series (from 2000), up 37% on H2 2013. US jewellery demand was again notable for its improving trend: Q4 was the seventh consecutive quarter of year-on-year growth and the strongest fourth quarter since 2009. Similarly, 2014 full year demand of 132.4t was the highest for five years. That being said, it clearly has to be acknowledged that the market remains far below pre-crisis levels of jewellery demand, which between 2000 and 2006 averaged 360t per year. In considering jewellery demand, it is interesting to look at the contribution that the sector has made over recent years to the accumulation of above-ground stocks. Jewellery is by far the largest component of above-ground stocks of gold – accounting for almost half of the 177,200t of gold estimated to be held by private owners and central banks. Jewellery consumption less recycling provides a fairly good proxy for net demand (as the vast majority of recycled gold will be old jewellery). In years gone by net jewellery demand regularly added as much as 2,000-2,500t per year to above-ground stocks. This plunged to less than 100t during the depths of the global financial crisis as distress selling of gold skyrocketed in tandem with a slump in jewellery demand. The last two years have seen net jewellery demand recover to exceed 1,000t. This is partly due to a firming of jewellery demand as the world has emerged from the crisis. But by far the greater impact comes from the recycling sector and the sharp reduction in the volumes of gold being sold back onto the market. Above-ground stocks of jewellery should continue accumulating at a similar rate as we expect recycling to remain low in 2015, counterbalancing the recent growth in mine production. In short, even with extended draconian measures created by India to prevent capital account outflows as a result of uncontrolled gold imports (which still take place only "under the table"), a whopping 1000 tons of gold ended up in the form of gold trinkets in 2014 mostly in India, and to a lesser extend in China. All of that is about to change: earlier today India's Economic Times reported that the RBI, surely facilitated by the drop in oil prices - a key import for India - has finally lifted its ban on imports of gold coins and medallions by banks and trading houses. The RBI in a notification also said banks are permitted to import gold on consignment basis. Domestic sales will be, however, permitted against upfront payment only. "While the import of gold coins and medallions will no longer be prohibited, pending further review, the restrictions on banks in selling gold coins and medallions are not being removed," it said. The RBI and the government have been receiving requests for clarification on some of operational aspects of guidelines. Aiming to tame the then widening current account deficit (CAD), the central bank in August 2013 had prohibited imports of gold coins and medallions besides restricting inbound shipments of the metal. Under the 80:20 scheme, which was withdrawn on November 28 last year, gold imports were linked with its exports. The notification further said the obligation to export under the scheme will continue to apply in respect of unutilised gold imported before November 28, 2014. "Banks are free to grant gold metal loans," it said, adding that Star and Premier Trading Houses (STH/PTH) can import the metal as per entitlement without any end use restrictions. "Nominated banks are now permitted to import gold on consignment basis. All sale of gold domestically will, however, be against upfront payments. Banks are free to grant gold metal loans." Why is that important? 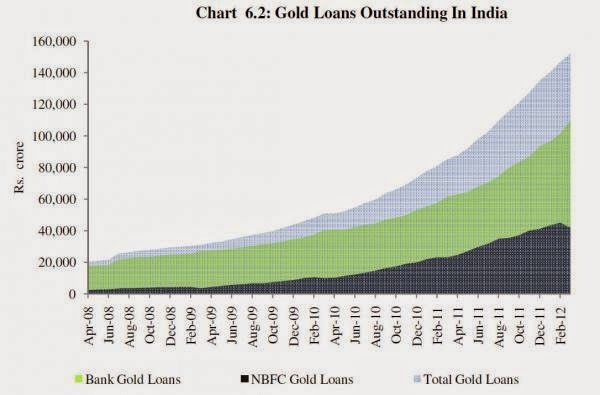 Because as we wrote in January 2013 in "Don't Show Bernanke This Chart Of Gold Loans In India", before the import ban, gold in India was most certainly money, and the amount of gold loans being created in India was simply exponential. However, since the importing of gold and its reuse as a money-equivalent collateral meant even more undesired capital outflows, the RBI was forced to halt the practice. Until now. What all of the above simply means is that the government, tired of fighting a losing war with gold smugglers, has opened up one more avenue by which gold can enter the country on an official, and taxable basis, and as a result physical gold will now resume flowing into India officially, a process which depending on how much gold is being mind out of the ground could mean a rapid depletion of the net available gold in any one period. It also means that going forward, India's true gold demand will finally be on the books, as banks find numerous loopholes to pass on the imported gold to end consumers - either in physical or loan form - only this time with the total tonnage once again being officially represented, as was the case in previous years. By way of example, gold imports surged by 8.13% Y/Y to $1.55 billion in January after the initial RBI restrictions were eased. Expect this number to spike that much more in the coming months as banks rush to reload on physical, especially with paper gold prices determined mostly by ETFs and manipulated by central banks, continue to make purchases (in most currencies, and certainly the dollar) increasingly more attractive, just as the CEO of Rosneft explained is happening to oil right now. Finally, for those who are unaware, India is considered the largest importer of gold - a title it shares on again, off again with China, the bulk of whose gold imports are also undocumented as they end up almost exclusively in some bonded warehouse where the gold is used as (infinitely) rehypothecated collateral for Commodity Funding Deals and/or in the vault of the PBOC. I parse the Russian media (corporate and social) on a daily basis and I am always amazed at the completely different way the issue of western sanctions is discussed. I think that it is important and useful for me to share this with those of you who do not speak Russian. Second, nobody in Russia believes that sanctions are a reaction to Crimea or to the Russian involvement in the Donbass. Nobody. There is a consensus that the Russian policy towards Crimea and the Donbass are not a cause, but a pretext for the sanctions. The real cause of the sanctions is unanimously identified as what the Russians called the "process of sovereignization", i.e. the fact that Russia is back, powerful and rich, and that she dares openly defy and disobey the "Axis of Kindness". Third, there is a consensus in Russia that the correct response to the sanctions is double: a) an external realignment of the Russian economy away from the West and b) internal reforms which will make Russia less dependent on oil exports and on the imports of various goods and technologies. Fourth, nobody blames Putin for the sanctions or for the resulting hardships. Everybody fully understands that Putin is hated by the West not for doing something wrong, but for doing something right. In fact, Putin's popularity is still at an all-time high. Finally, I would note that while Russia is ready for war, there is no bellicose mood at all. Most Russians believe that the US/NATO/EU don't have what it takes to directly attack Russia, they believe that the junta in Kiev is doomed and they believe that sending the Russian tanks to Kiev (or even Novorussia) would have been a mistake. The above is very important because if you consider all these factors you can come to an absolutely unavoidable conclusion: western sanctions have exactly zero chance of achieving any change at all in Russian foreign policy and exactly zero chance of weakening the current regime. In fact, if anything, these sanctions strengthen the Eurasian Sovereignists by allowing them to blame all the pain of economic reforms on the sanctions and they weaken the Atlantic Integrationists by making any overt support for, or association with, the West a huge political liability. But the Eurocretins in Brussels don't care I suppose, as long as they feel relevant or important, even if it is only in their heads. The confusion over commodities transaction tax (CTT) on 38 new agricultural commodities is clear now. The government has neither levied as such any CTT on the trading of any new agricultural commodities nor removed it from the any commodity already covered in the list under CTT. 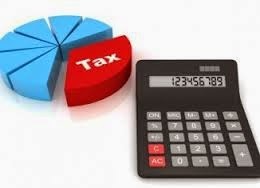 In fact, the Central Board of Direct Taxes (CBDT) has expanded its list of the commodities exempting CTT; a finance ministry official source cleared the confusion. He added, the commodities included in this list will remain out of the ambit of CTT or CTT will not be levied on these commodities. Previously, the news appeared in the media that the commodities transaction tax (CTT) would be levied on 38 new items of agricultural commodities as the Finance Ministry has expanded the list of agricultural commodities coming under CTT by adding 38 commodities to the existing number of 23. This created confusion in the market. After including several agricultural commodities in the Non-CTT list, the government has opened a new window for new contracts in the agricultural commodities which exchanges now can initiate. The new commodities included in the list are rice, bajra, ginger, sesamum, small millets, tur, tur dal, urad, urad dal, onion, groundnut, moong dal, methi, ragi , betelnuts, cinnamon, nutmeg, jowar, linseed, gram daland sunflower seed. Presently, some of the new items added to the list are not traded on commodity exchanges. The government has added 38 more products to the list of commodities exempt from commodity transaction tax (CTT), raising hopes among commodity exchanges and a section of brokers that the Centre might favourably consider a regulatory recommendation to reduce the levy, if not withdraw it altogether, in the Union Budget. Twenty three commodities like oilseeds, raw cotton, spices, etc, were exempt from CTT, introduced in July 2013. The government has exempted 38 more commodities from the levy. Many of these, onion, seedlac, ginger, gram dal, gram husk, masur, methi, safflower, rice, paddy, sesamum, moth, small millets, etc, are either not traded or are illiquid and some like urad and tur have been banned from futures trading. However, the move drew praise from leading agri commodity bourse NCDEX and a few brokers. "....... it (the development) reflects the growing recognition and confidence in the government that markets are taking a very crucial role in the agricultural economy through our efforts such as developing smart mandis, digital e-procurement platforms for government bodies, warehousing finance at the farmer's doorstep and efficient collateral management," said Samir Shah,MD and CEO, NCDEX. Chirag Shah, head of commodities & global futures, Phillip-Capital, said the move "boosted" sentiment that the government was on the "right track" to grow the nascent commodity futures market. 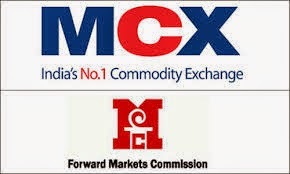 The development on February 10 came days after Forward Markets Commission, or FMC, which regulates the 11-year-old commodity futures market, recommended to its parent — the finance ministry —to either withdraw or reduce the levy from the current 0.01% on the seller FMC data show that volume shrank 41% to Rs 101.4 lakh crore in FY14 (Apr 2013 - Mar 2014), the fiscal year the tax was introduced on non-farm and processed farm contracts such as gold, silver, crude oil, cotton, soya oil and sugar. In the fiscal year through January 2015, volume has fallen 42% toRs 51.3 lakh crore from the same period last year. Moreover, CTT collection has been significantly lower than from securities transaction tax (STT) on stock market transactions. On MCX, the country's largest commodity exchange with 90% market share, collection in the fiscal year through December was Rs 374.35 crore against Rs 4,940 crore in STT over the same period.